Welcome one and all to another "Retro Review" edition of Longbox Junk! This week, we travel back to 1964 to take a look at DC's long-running team up title, The Brave & The Bold. I've previously dipped into B&B here on Longbox Junk, but more toward the end of its run during the 80's. I found the issues I reviewed (with a couple of exceptions) to be pretty weak and not seeming to have much effort put into them. It was obvious that the title was about done for. The issue at hand is from quite a bit earlier in the Brave and Bold run, before the title pretty much became an exclusive Batman team up vehicle. Does it maintain the same lackluster quality I found in later issues? Let's find out! Starting off before even opening the book up, I wasn't too impressed with the cover on this one. It's just sort of pale in overall color and The Atom looks kind of strange. . .like he's too big to make much of a difference in the battle pictured, but at the same time too small to do more than stand there squeaking exposition at potential comic buyers. After my experience with the mediocre issues I previously reviewed, I prepared myself for more of the same as I looked at the cover of this one. Despite the pretty weak cover, I found myself pleasantly surprised by what was inside. The Metal Men are destroyed one by one by various means until the villain reveals himself to Doctor Magnus. It turns out to be his FIRST Metal Man, Uranium (and Uranium's own creation, Metal Woman Agnatha. . .or Silver). Magnus' original creation was brilliant, but twisted, so Magnus destroyed him. . .or so he thought. Uranium was brought back to life by an atomic explosion, and since then he has worked to destroy The Metal Men so that he can prove he's the greatest of Magnus' creations. Uranium and Agnatha take Magnus prisoner and force him to help build a ray that destroys any metal. Magnus manages to beam out a secret message that is received in the lab of Dr. Ray Palmer. . .The Atom. . .who rushes into action to rescue Dr. Magnus. 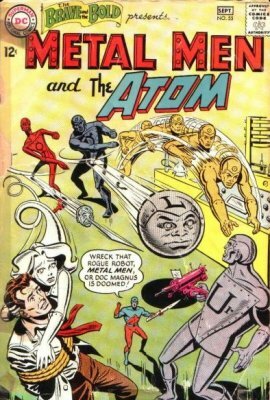 Atom discovers that the molecular structure of each of The Metal Men was altered, so he shrinks down to atomic size in order to reconstruct them all, then leads them to a confrontation with Uranium and Agnatha, where the heroes win the day, defeating the villains, destroying the anti-metal ray, and rescuing Doctor Magnus. Overall, it's a pretty well-written story, told in a straightforward manner and with a villain I could feel some sympathy for. It's a classic "The flawed first creation returns to haunt the creator" story that has been told over and over again. . .the most obvious example that comes to mind is the saga of Data and his predecessor, Lore, from Star Trek: The Next Generation. The battle ending the third act of the book was somewhat hokey, with quite a few forced-sounding quips and some strained effort to give every character a moment in the spotlight, but it wasn't so bad as to bring the whole story down. All in all, despite a few weak moments, I found this story to be surprisingly good. It's not the greatest tale ever told, but given the time period this comic is from, it's far from the worst. As for the art. . . I've said it before, and I'll say it again. . .one of the things I like about the "Retro Review" editions of Longbox Junk is that it gives me the opportunity to learn new things about comic book history in the process of taking a closer look at the comic being reviewed. This time out, I learned about a remarkable woman that I had never heard of before, an artist named Ramona Fradon, who did the pencils on this issue. I'm not going to bog down this review with a lengthy diversion into one of the creators, but if you are not aware of Fradon's place in the male-dominated comic industry of the 1960's, I heartily suggest that you read up on her. The art in this issue has a clean, dynamic style to it. Sparse backgrounds draw attention to the fine detail of the characters. In particular, I really liked her depiction of The Atom and his shrinking/growing powers. I wrote at the start of this review that the cover (also by Fradon) wasn't really impressive. On a second look, I realize that was mostly due to the bland coloring. The line art itself is actually pretty nice (But I still think Atom looks a little strange for some reason). Overall, despite a somewhat weak punch-fest ending, I found this issue of The Brave & The Bold to be pretty enjoyable. The story was well-written. The art was very nice. And I learned something new about an artist I'd never heard of because of reviewing it. I would definitely call this one a winner. Back to Longbox Junk as usual with a mini that asks the question "What happens when the Joker shows up in Gotham and Batman is off somewhere else with The Justice League?" It's Tim Drake putting on his big boy pants in Robin II: The Joker's Wild.